Gore metal maniacs EXHUMED announce headline US tour dates for the end of Fall with Arkaik. The tour commences November 15 in San Diego, CA and ends December 8 in Oklahoma City, OK. A full list of confirmed tour dates is available below. Additionally, EXHUMED’s impending Death Revenge full-length is officially released this Friday, October 13th on CD/LP/DLX LP w/CASS/Digital via Relapse Records! Physical packages and digital orders are available via Relapse.com HERE and all digital retail outlets HERE. Watch EXHUMED’s previously released videos for “Night Work” HERE and “Lifeless” HERE. 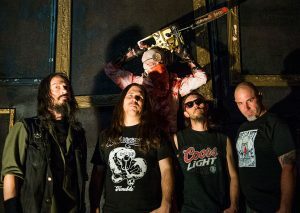 Lock the mausoleum doors and chain up the cemetery gates – long-standing Gore Metal maniacs, EXHUMED re-emerge with their disgusting new album Death Revenge. The band’s 6th full-length sees them tread into ambitious new territory with their first concept album; a musical melodrama in thirteen parts based on shocking true events. Death Revenge takes place in the late 1820s in Edinburgh, Scotland and tells the macabre tale of a series of brutal murders where the victims’ cadavers were sold to anatomists, amid a grisly underground trade of grave-robbery. Recorded with producer Jarrett Pritchard (Goatwhore, Eternal, Gruesome), Death Revenge takes the band’s signature gore-drenched, death metal mayhem to theatrical and ghastly new depths.